At the beginning of March, I got to cross off the top item on my bucket list all thanks to my wonderful husband! We finally went on our European honeymoon (only a year and some change later)!! We were able to spend three nights in London and three nights in Paris. I have been dreaming of Paris since I was a little girl. Something about that Mary Kate and Ashley movie, Passport to Paris, just had me hooked! Now planning an international trip is no easy task, especially when it is your first one ever! 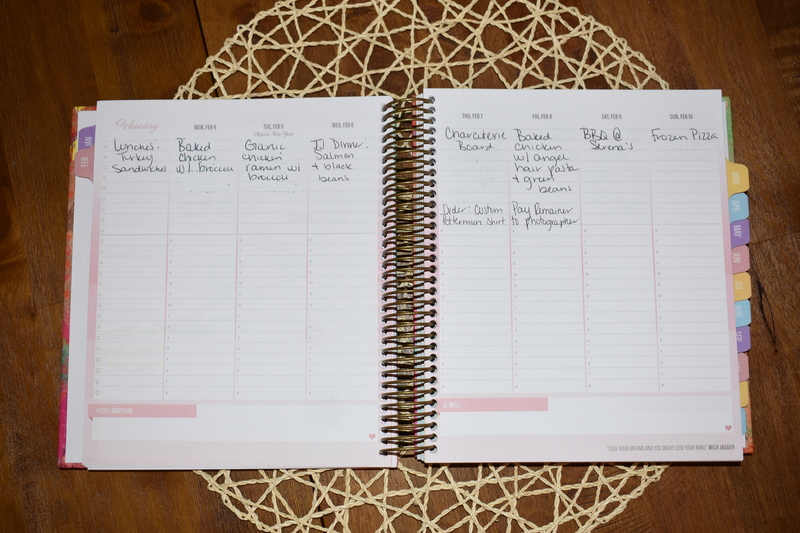 But luckily for me, I had my Keeping It Together planner to help me keep everything organized. As one of Liz’s besties, I have been a KIT girl since the very beginning. Writing down my plans always helps me to stay on track, so I used my KIT planner to help me plan all the big items, from booking our flights to booking sight-seeing tours. I purchased my planner well in advance so that I could start preparing for the new year and our BIG trip. The thing I love most about planning things out well in advance is that it helps me stay on budget, which just so happens to be one our big 2019 goals. #GOALDIGGER! We are following Dave Ramsey, any other KIT girls here following his baby steps to live a debt free life? Focusing on when we would get paid and what bills were due, I set up a plan on when we could book our different trip tours. This way, everything was paid for before we went on our trip, with one exception, a vintage sight seeing tour that we booked; they only accept cash at the end of the trip so we were unable to eliminate this expense ahead of time, however we were able to pencil them in so we could still account for it in our budget! One thing you must know is that I am a HUGE Harry Potter nerd. For my husband and I’s first date he took me to the Wizarding World of Harry Potter at Universal and it was just about the most magical first date that ever existed! Because of this, I had to add The Making of Harry Potter studio tour in London to our list of must-sees. I searched months in advance for tickets and while the actual Warner Brothers website was sold out (I may have cried over this), I had a friend recommend the tour website Viator and found not only the tickets for the tour but it also included a bus trip, which was very important since it turned out that the studio was an hour and a half outside of the city! Since we booked the flights with the last paycheck of 2018, we waited till after the next pay day to book some of the tours that we were excited about, including Harry Potter. Another must do on my European honeymoon list was taking in a show at the Moulin Rouge! One of my favorite movie musicals of all time and such a classic thing to partake in while visiting Europe, we booked this in the same week as the Harry Potter studio tour. They were two of our biggest outings (also, the most expensive) and we didn’t want them to sell out so I made sure to make these my first bookings! I love how my daily planner gives me space not only for appointments, but also for items like what I’m making for dinner and things I need to get done that day. I used this note section for writing when I wanted to book our tours and what the cost would be. The final booking we made was actually one I made in secret. Since Paris, and more specifically, the Eiffel Tower, were at the tope of my bucket list I really wanted to capture the memory for a life time. I love photographs as my mementos more than anything else. I blame my mother and her constantly putting a camera in our face no matter where we were when I was young. I decided to book a professional photographer to take a mini photo shoot session with in front of the Eiffel Tower. I discovered our photographer on Instagram and if you’re taking a big trip I would absolutely recommend doing a little search in your Instagram feed for a “ (name of location) photographer”. I’ve been able to find them in other cities and countries for friends taking trips. They’re the perfect souvenir and you don’t have to worry about fitting it in your luggage for your journey home! I hope by sharing my planning I can help you in planning (and budgeting) for your next adventure using your KIT Life planner! To get the full scoop on all our European honeymoon details head on over to The Luck of the Monaghans or, follow me on Instagram. I don't know if I'll ever stop sharing pictures of the trip!